Spectrum-RG is a Russian - Germany X-ray astrophysical observatory. Germany is responsible for the development of the key mission instrument - the X-ray grazing-incident mirror telescope eROSITA. The second experiment is ART-XC - an X-ray mirror telescope with a harder response than eROSITA, which is being developed by Russia (IKI, Moscow and VNIIEF, Sarov). The scientific payload is housed on the Navigator bus, developed by Lavochkin Association (Russia). Spectrum-RG will be delivered to L2 point with use of Soyuz-2 rocket and Fregat buster. The total mass of the SRG is about 2200 kg. The SRG mission will be launched from Baikonur and the observational program will last 7 years. The first 4 years will be devoted to an all-sky survey, and the rest of the mission lifetime will be spent on follow-on pointed observations of a selection of the most interesting galaxy clusters and AGNs. 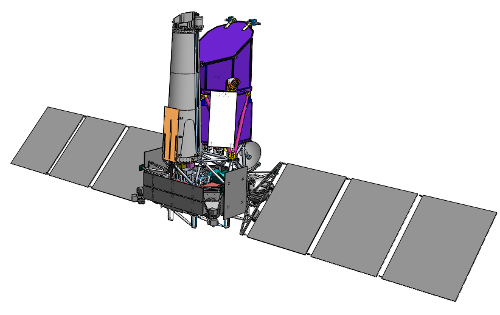 The mission will conduct all-sky survey in the 0.5 - 11 keV band with the imaging telescopes eROSITA and ART-XC. It will permit the discovery of all obscured accreting Black Holes in nearby galaxies, many (~millions) new distant AGN, and the detection of all massive clusters of galaxies in the Universe. In addition to the all-sky survey, dedicated sky regions will be observed with higher sensitivity and thereafter follow-on pointed observations of selected sources at energies up to 30 keV will take place in order to investigate the nature of dark matter, dark energy and physics of accretion.